The Atletico Madrid stadium, Vicente Calderon is conveniently located just outside the city´s central district on the southern side. Easily reached by Metro or Bus its close proximity to the centre of Madrid means even a taxi ride isn´t out of the question! 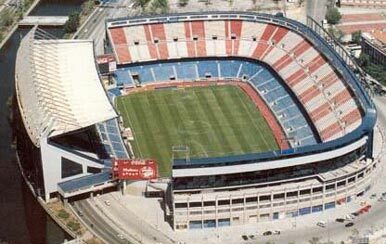 Whilst smaller than the stadium of city rivals real Madrid the Atletico Madrid stadium is both more modern, having been constructed in 1966 and cheaper to get in to. See here for Atletico Madrid stadium prices. 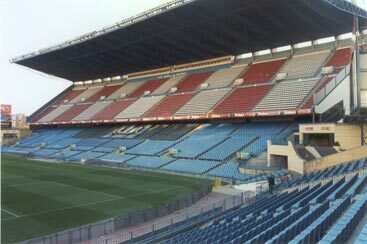 Of course it goes without saying that the Vicente Calderon also has far more atmosphere on match days from its more vocal and passionate supporters! The stadium is comprised of two tier open seating around three sides with a covered main stand (as shown here) set apart and housing the Dressing rooms and official club facilities. One interesting fact about the stadium is that the Northbound part of the M-30 motorway ring road passes underneath the main stand! 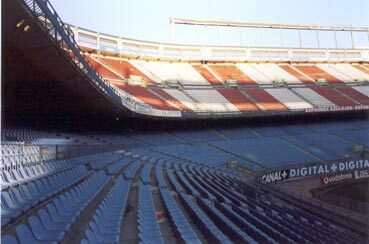 The Eastern end of the ground and on the bottom tier is where the died in the wool Atletico Madrid fans congregate to cheer on their team. Known as "Ultras" they make sure they have a day out win, lose, or draw. Responsible for starting numerous songs and chants to encourage the team throughout the game they think of themselves as being more "Atleti" than the club itself, Ultra in Spanish translates to Fanatic in English! Despite being known as some of the most ferverent supporters in Spain there is no violence associated with these fans with the only examples of disorder being directed at the pitch rather than off it. In 2004, during the Madrid derby game, a Real Madrid player moved the flowers (put out every game next to the North east corner in remembernce of the players killed in the Civil war) in order to take a corner and was subsequently bombarded with litter and in 2005 a game was halted for 15 minutes due to a glass bottle having been thrown on the pitch. Away fans are given the upper part of the west stand and except for derby matches against Real Madrid very rarely sells out. It is one of the ironies of Spanish football that within Spain fans tend not to follow their team to away games. If you are coming to Madrid for a football match be sure to visit this thread in the forum Away travellers guide. 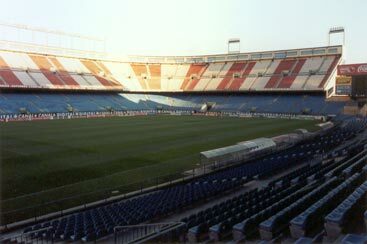 For more detailed assistance take advantage of the site editor in the forum, He is an English guy who is a long time ST holder in the Vicente Calderon!